European and Asian spot gas prices have halved across the last six months. European hub prices are currently testing the 5.0 $/mmbtu level, down from almost 10 $/mmbtu in late September 2018. The key JKM Asian price marker has converged towards TTF price support and is currently around 5.5 $/mmbtu. This plunge in prices across the current winter, has the LNG market firmly focused on the near-term supply & demand balance. Debate is raging as to whether the current wave of new LNG supply (2016-21) is starting to outstrip demand growth. In today’s article however, we are going to take a step back, look beyond the near term market balance and consider the potential timing and volume of a new wave of supply in the mid 2020s. We have flagged several times that lower near term prices may increase the risk of a tightening LNG market in the early to mid 2020s. This is because there has been a relative hiatus of liquefaction project FIDs across the last three years. New projects take 4 to 5 years to deliver. That leaves a potential supply gap in the 2022-25 horizon if global demand growth remains strong. But from the middle of next decade a new wave of supply is starting to take shape. 34 mtpa of new projects have now been FID’d across the last 12 months. And there is a much larger volume of credible supply options queueing behind this. We explore today what this next wave could look like. Is this time ‘really different’? The LNG sector is noted for its cyclicality of investment. Past LNG supply waves have been built on buyer’s anticipation of demand 4 to 5 years into the future. This has underpinned buyer willingness to sign long term contracts (mainly on an oil indexed or Henry Hub plus costs basis). Offtake contracts have then allowed project developers to secure non-recourse financing. Asian buyers such as Japan, South Korea and Taiwan are uncertain of their future LNG requirements given risks around changing energy mix policies and in the case of Japan nuclear re-starts. India’s LNG requirements are difficult to gauge given the price sensitivity of its power generation and fertiliser sectors and the lack of a significant space-heating sector to underpin infrastructure extension. For Thailand, Pakistan and Bangladesh the uncertainty of indigenous production decline rates makes future LNG requirements difficult to judge. For these reasons, China remains the key market where long term contracts for end use consumption appear most likely. We have previously flagged that the next wave of new LNG supply will likely be dominated by gas majors (e.g. Shell, Exxon, Qatar & BP). Large trading functions and access to balance sheet financing give them a comparative advantage over independents who rely to a greater extent on non-recourse finance (and hence long term contracts). This has been borne out across the last 6 months by the Shell Canada, BP Tortue and Exxon Golden Pass FID’s. Portfolio players have also facilitated the financing of LNG projects by signing up for the entire offtake of third party LNG projects (BP and the Mozambique Coral project and US Freeport train 2). The portfolio player ‘direct upstream financing’ and ‘large offtake agreement’ model is supporting new LNG upstream FIDs in a period of uncertain Asian LNG demand growth. There is still space for some ‘traditional model’ projects, where buyers underwrite supply with long term contracts. But the timing and volumes of supply in the next wave will be driven to a greater extent by the gas major’s assessment of supply and demand balance from the mid 2020s. If the majors think the market will hold new supply then they will pull the FID trigger. What could the next wave look like? It is important to note that the chart does not represent a projection of anticipated volume ramp up timing. This is something that will start to become clearer as FIDs are taken and construction commences. The chart is instead illustrating when new project volumes could credibly come online given existing and potential FID dates. Egypt currently has significant idle LNG export capacity. But its net export position could recover by up to 9mtpa in the early 2020s. This is driven by new offshore gas fields coming onstream and the possibility of gas being piped in from gas discoveries and developments offshore Cyprus and Israel. The re-start of supply from Yemen is dependent on the cessation of civil conflict, but 7 mtpa capacity could be back onstream by 2025. New liquefaction project FIDs have been relatively scarce in recent years (e.g. in 2017 the Mozambique Coral Floating LNG scheme was the only FID). May 2018 saw the FID on Corpus Christi Train3, but the last six months have seen a surge in activity with (i) BP’s Mauritania/Senegal Tortue (ii) Shell’s LNG Canada Project and (iii) the Exxon/Qatar US Golden Pass project reaching FID. These three projects in aggregate represent 34 mtpa of capacity. Qatar suspended its rolling Moratorium on the North field development in 2017. The Qataris then announced four new LNG trains (total capacity 32 mtpa) which are widely expected to result in FIDs in 2019 and 2020. We have broken out Qatari gas into a separate category from other potential FIDs, given the economics, buoyed by significant co-production of condensate and NGLs, are so compelling. In other words the development of new trains is a question of when not if. There is also an additional 86 mtpa of credible liquefaction projects that could potentially reach FID over the next 1-2 years. In Mozambique the Anadarko-led project (12.7 mtpa), having recently signed its 5th SPA (with Pertamina) brings its long term contract coverage to 74% of capacity. An FID is anticipated in 1H2019. The Exxon-led Rovuma project in Mozambique (15.1 mtpa) is also reported to be advanced in securing offtake agreements and is also expected to take FID in 2019. Canada’s Woodfibre project FID (2.1 mtpa) may also FID in 2019. In Papua New Guinea Exxon/Total’s expansion project (7.9 mtpa) is also at an advanced stage and should take FID in 2019. Novatek’s success in executing the Yamal LNG project has given them the confidence and momentum to move to the Arctic LNG project for which pre-FID engineering is progressing. This 19.7 mtpa project is expected to take FID in 2019. In the USA, credible FID’s in 2019 or 2020 include Sabine Pass train 6, Calcasieu (2 trains), Corpus Christi trains 4 and 5 and perhaps a little later, Freeport train 4. In summary, restarts and committed projects are anticipated to increase supply by around 49 mtpa by the mid 2020s. There is another 32 mtpa of Qatari gas that will almost certainly come to market mid next decade, but with some uncertainty around timing. In addition a further 86 mtpa of capacity has credible FID potential across the next 2-3 years. That’s a total of 167 mtpa of committed and credible new capacity. The recent surge in LNG project FIDs is being driven by the perception of major LNG portfolio players that a global supply-demand gap is emerging early to mid next decade. This is different to the current wave of supply, driven by ‘demand pull’ from end-user buyers willing to sign up to long term contracts. The uncertainty created by this year’s ongoing slump in European & Asian spot prices will impact the pace of new FIDs. It is harder to sign off projects against a backdrop of plunging prices. If players get cold feet this year, FID timings may slip e.g. Qatar, Russian and US projects. But there is significant momentum building behind a new wave of LNG supply from the mid 2020s, similar to those experienced from 2015-20 and 2006-10. 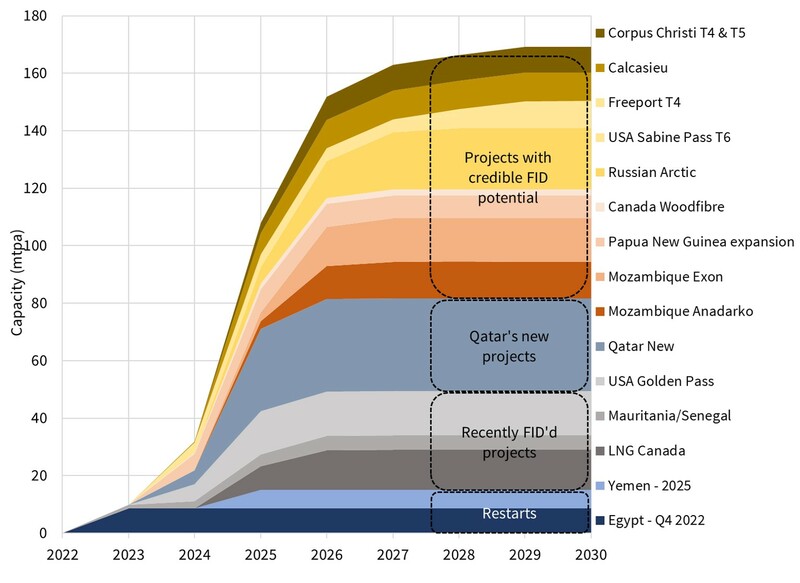 But will this next wave arrive in time to prevent a tight LNG market in the 2022-25 horizon? That will depend largely on the strength of Asian LNG demand growth and the volume of new FIDs taken over the next 12 months.